Welcome to ‘Hughes Maui Condo’ – ground floor unit #113 of building 10 at the Kamaole Sands Resort. This is a beautifully renovated 1 bedroom condo with 2 full bathrooms and very nice furnishings throughout. Our condo is located on the walk-out first floor level of the Kamaole Sands Resort just 100 yards from Kamaole #3 Beach, one of the best beaches in the world! There you will find great snorkeling, diving, swimming, boarding and sunbathing. Building 10 is *the closest* to the beautiful Kamaole 3 beach! We limit our one bedroom condo to a maximum of 2 adults, but it will also accommodate 1-2 small children. The condo is a spacious 818 sq. feet (76 sq. meters) not including the extra large lanai and has beautiful new tile floors throughout. This complex has the rare combination of a great pool and great tennis courts. World class golf awaits you within minutes at the Wailea and Makena golf courses or via a short drive to many other courses including Kapalua Plantation and Kaanapali. World-class surfing is also nearby. This unit is a short walk to several restaurants, bars and small shops. It is located near exquisite island dining, and the 'Shops of Wailea’. The Kihei boat ramp and daily trips to Molokini are just a short walk from the unit. 'Hughes Maui Condo' is an all-around great choice! We pride ourselves on listening to our guests and continually updating and upgrading the condo to keep so it keeps getting better and better. Please see our owner information section to get to know who we are. The renovation includes all stainless steel kitchen appliances, kitchen cabinets, counter tops, LED light system throughout, vanities in each bathroom, fixtures, new tile, etc. You'll love our new bedroom suite, California King bed with a Serta Premium mattress, the distinctive Plantation shutters and 32” flat screen HDTV. We have also installed a new Whirlpool Duet washer/dryer stack. Old wicker furniture has been replaced with new furniture which surround a new Samsung HDTV. Now that the fiber optic upgrade is complete, enjoy free ultra high speed wireless internet in the condo and on our extra-large lanai that has new cushions in 2017. Use your Netflix, iTunes, Spotify, and Pandora accounts and enjoy. We are confident that a unique island experience awaits you at this very special Maui condo. Aloha! We are Lindy and Bob Hughes and are the proud owners of this beautiful Maui condo. We were lucky enough to purchase this beautiful condo from the Boone family in 2013. When we discovered this unit, we immediately fell in love with it and we know you will too. Lindy and her family have very deep roots in Hawaii. Maui has an especially close in her heart since this is where her parents met when attending High School and they eventually moved to Honolulu where Lindy was born. Maui was also our honeymoon choice, and we share a deep love for this island. Today we have two daughters and three sons and live in Portland, Oregon. We are fortunate to be a short flight away from beautiful Maui and visit whenever we can. Our guests benefit from our 17+ years of experience as customers of HomeAway and we strive to provide them with a truly wonderful experience that make them feel that our condo is an extension of their own home. Mahalo! We have vacationed many times in Oahu, Maui, the Big Island, and Kauai, but love Maui and the Kihei / Wailea region the most. We love the many beautiful beaches on this side of the island where it tends to be less crowded and sunnier than the west. We enjoy the many quirky bars and restaurants and small shops on South Kihei Road that are a short walk from our condo. We have always been very impressed with the manicured grounds of the 15 acre Kamaole Sands Resort and the helpful and friendly staff that take great care of the complex and make continuous improvements. The walls, floors and ceilings of the buildings in this complex are concrete with tile rooftops and this high quality construction keeps the units quiet and comfortable. Kihei and Wailea shopping is great for everyday needs as well as designer shops, and specialty shops for those unique one-of-a-kind items. Kamaole Sands is just 20 minutes from many other shopping opportunities in Kahului as well as the conveniently located international airport. This is a great all around location for that we are very proud of! Most of all, we love being so close to the beautiful Kamaole 2 and 3 Beaches. As often as we can, we walk 3 minutes down to the beach to watch the sunset. In the wintertime, whales really put on a show right in your own backyard! Take a swim or go snorkeling off our beach, and you can swim with the turtles and triggerfish! You have many choices for fantastic local dining in Kihei/Wailea, or if you want, you can grill outside a short walk from the Lanai. And, with our modern and well-stocked kitchen, cooking in the condo and eating on the ground floor lanai is a real treat! We absolutely love to sit out on the large lanai and enjoy the beautiful fountains, beautiful park-like setting and ponds, and amazing ocean view – we feel that this location has it all! Master Bathroom has a beautiful walk-in shower. New AC units in the Master Suite and Living room. Two Ceiling Fans plus additional Fan also provided to help circulate the cool ocean breeze. New large capacity and very quiet Whirlpool Duet washer in unit. New large capacity Whirlpool Duet dryer in unit. Free recently upgraded Fiber-optic Ultra High Speed Wi-Fi for use in the condo and on the lanai. Ready for Netflix, Prime, Pandora! Computers and Printer in Lobby 24/7. Free Wi-Fi also at the Pool. No need to fill your suitcase with beach towels - we have you covered with large premium towels! Small recently remodeled fitness room with modern cardio and weight equipment at pool / clubhouse. New and very quiet KitchenAid Stainless Steel dishwasher. Full Size GE Stainless Steel Refrigerator with Ice Maker. New Cuisinart coffee maker - no filters required. New Electric Kettle for tea drinkers. ... and rice cooker also provided. Starting set of paper goods and most spices provided. Fully stocked with new items added regularly. Full size dining table and chairs for 4. Spectrum Cable with upgrade package. Record HD on our new DVR and don't miss a thing. New Bluetooth-enabled Sound Bar in Living Room. Connect over Bluetooth and play your own tunes or stream your favorite iTunes/Pandora/Spotify station. Internet Enabled Blu-ray/DVD Player! Select from our video library, rent disks locally, or log-in to your personal Netflix/Prime account and enjoy. Book sharing area in the condo and also at Pool/Clubhouse area. Ping Pong and Foosball at Pool/Clubhouse area. Growing DVD library provided in unit. Manicured gardens surround the Extra Large Lanai. Premium Beach Chairs, Umbrellas, Boogie Boards, plus Snorkeling Gear, Coolers, Water Toys, ... all in the Lanai Closet for your use! 4 very nice communal courts await! Sign up at the registration office. $5 racket rentals available there. Wailea and Makena courses 4 and 6 miles away respectively. World class Kapalua Plantation and Kaanapali and more a short drive. Large and Beautiful Resort Pool plus separate 2' foot Wading Pool for small children. Two Jetted Spas in pool area - 1 for families and 1 only for adults. Electronic Safe in Master Suite. Great stay😊 loved the close proximity to fabulous beaches! Nice pool setting, enjoyed the fact there was a separate kids hot tub. Everything we needed was available in the condo. (Even aloe vera lotion in fridge which my sunburn loved 🙄). The welcome gift of goodies was awesome! The condo was clean, well laid out and absolute perfect for us. We had a lovely vacation at Lindy and Bob's condo. It was perfect for our family of 4 (2 teenage boys). The location in the complex couldn't have been better - it is a quick walk to the beach, to the pool and to the shared BBQ areas. 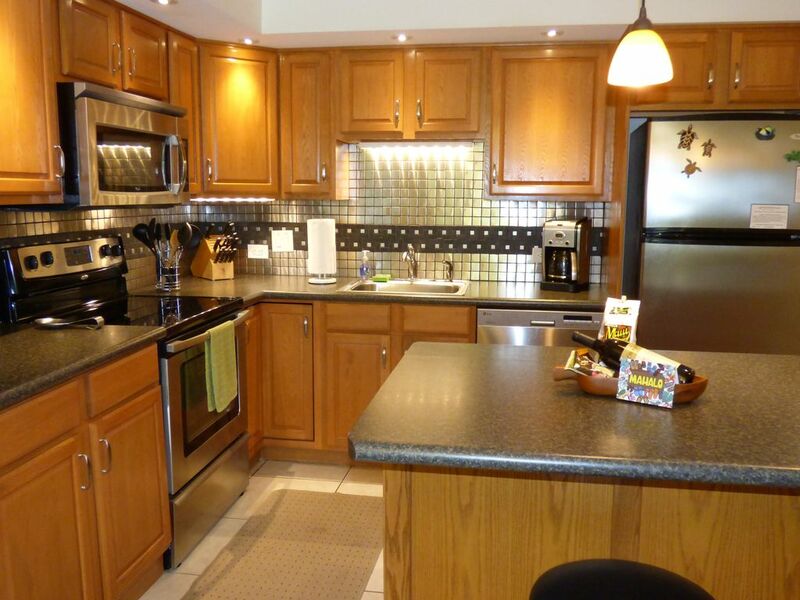 The condo is well appointed and is stocked with everything that you might need while on vacation. We loved our welcome gift - coffee, wine and chocolates - a nice way to begin our vacation. Bob and Lindy were great to deal with and made us feel at ease with our choice of rental. We hope to be back to this little piece of paradise!! We had a fantastic time while staying in the Hughes Maui Condo! It is modern, very clean, and filled with so many extras! The minute we walked into the unit, it was obvious we'd made a great choice. Bob and Lindy had provided a thoughtful welcome note and goodies for us, which we found just after entering. Location is perfect! Building 10 is the closest to the beach, and the unit is less than a five-minute walk across the street to the beautiful Kamaole Beach Park, and the peaceful beach area down below. The sunsets are not to be missed! Every evening we took beach chairs (found in the closet located on the lanai) to the park and waited for that spectacular show! We enjoyed breakfast on the spacious lanai most mornings, surrounded by beautiful landscaping and views of the ocean in the distance. Lunch and/or dinner was often a short walk down the street to one of the many eating establishments in the area. If we didn't want to venture out, we had the luxury of a fully equipped, extremely organized kitchen containing everything one could wish for, including an electric teapot (just like we have at home! ), tons of kitchen gadgets, and a wide array of pots and pans. It was so convenient having two full bathrooms, a washer and dryer, a comfy bed, plenty of linens (including beach towels), a lanai closet with so many beach toys, etc. The list could go on and on. This was our fifth trip to Maui for whale watching; in the past, we always stayed in Lahaina and never considered any other part of the island. However, now that we've been to Kihei, we have a new perspective and hope to return to Hughes Maui Condo next year! This unit is even better than described on VRBO, and we recommend it without hesitation! Thanks to Bob and Lindy for their attention to detail! Great Owners,Great location, Great remodel. Bob and Lindy offer one of the nicest, cleanest, best located, and best stocked condo in Kamaole Sands. If any negatives creep up, they are quickly erased by the positives. 7 night minimum stay requested unless filling gaps; 14 night minimum in 'Holiday Season' 4.166% General Excise Tax, 10.25% Tourist Accommodation Tax (Hawaii Tax ID: H0-1380782) One time cleaning fee $100. Other services available by request. $350 deposit. Long Term rates and terms are negotiable. Until confirmed, rates are subject to change without notice.